PS Classics continues its forgotten musicals series with a lost show by three giants of the American musical theatre: Harold Arlen, Ira Gershwin and Yip Harburg. 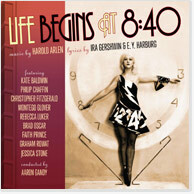 LIFE BEGINS AT 8:40 – featuring Arlen's ebullient melodies, Gershwin and Harburg's smart and playful lyrics, and captivating performances by an all-star cast including Bert Lahr and Ray Bolger – was one of the most lavish revues of the 1930s, and a solid hit of the 1934–5 season, spawning such standards as “You're a Builder-Upper” and “Fun to Be Fooled.” But it wasn't until 75 years later that the score would be heard again, in a concert presented in March 2010 at the Library of Congress, supervised by Betty Auman and Robert Kimball and sponsored by the Ira and Leonore Gershwin Trusts. That performance – featuring a full 24-piece orchestra conducted by Aaron Gandy and a cast of Broadway and recording veterans including Kate Baldwin, Philip Chaffin, Christopher Fitzgerald, Montego Glover, Rebecca Luker, Brad Oscar, Faith Prince, Graham Rowat and Jessica Stone – has been stunningly preserved in this new studio cast album. Arlen, Gershwin and Harburg's witty and effervescent score (set to the original orchestrations by Hans Spialek, Robert Russell Bennett and Don Walker, faithfully restored by Larry Moore) is brought vividly to life in PS Classics' world premiere recording.